Note: This post has been archived for historical purposes and no longer contains accurate information about our current products. If you would like to learn more about Cisco Meraki and our cloud-managed IT solutions, including wireless APs, switches, security appliances, security cameras, and unified endpoint management, please check out the Meraki products page. Update: the Cisco Meraki WiFi Stumbler is now available only for Android devices. Find it on Google Play. 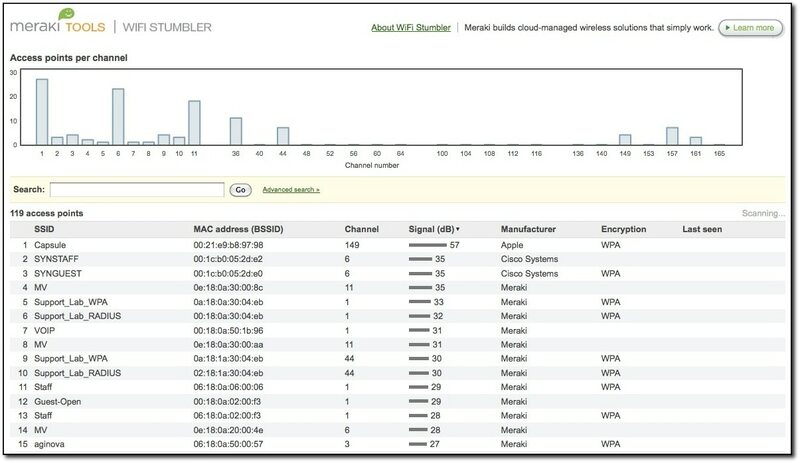 Today we are very excited to announce the release of a new free tool for the IT community: the Meraki WiFi Stumbler, the first browser-based wireless scanner. WiFi Stumbler provides detailed, real-time and continuously updated information about nearby wireless networks (even those with hidden SSIDs), including the type of access point, MAC address, wireless channel, signal strength, encryption type and more. It also features built-in search, sorting and filtering capabilities to make it easy to quickly find the data that you need when in the field troubleshooting networks. So what is cool about the fact that it runs in a browser? This means that there is no need to download and install software, making it a very convenient tool that can you can quickly have up and running whenever you need it. WiFi Stumbler will run in most browsers on either a PC or a Mac, and it can even be used when you are not connected to the Internet if your browser supports HTML5 offline mode (currently only Firefox 3.5, but Safari and Chrome support should follow soon as well). You can use WiFi Stumbler to optimize coverage and performance of existing networks, troubleshoot wireless performance issues, find rogue APs and perform basic site surveys when planning deployments. We will be adding new features and functionality to Stumbler on an ongoing basis – these features will be available to all users as soon as they are released. And since the tool is browser-based, there is no need to download and install the latest version of software, or add patches or software updates to get these features. Just reload the tool in your browser and the updates will “magically” appear. Check out http://meraki.com/tools/stumbler for more details and to try it out. WiFi Stumbler is still in beta release, so if you find any bugs or have any suggestions for new features please let us know using the Wish box in the tool. We hope you find this to be a useful addition to your toolkit!